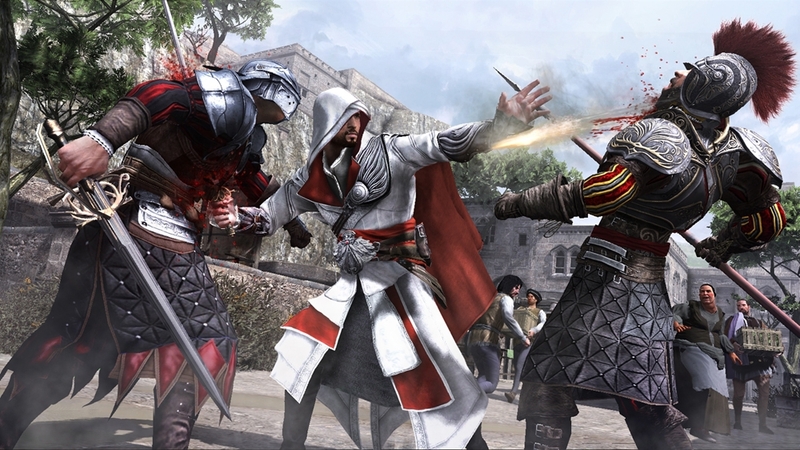 BE A LEGEND LIVE AND BREATHE AS EZIO, A LEGENDARY MASTER ASSASSIN, IN HIS ENDURING STRUGGLE AGAINST THE POWERFUL TEMPLAR ORDER. JOURNEY INTO ITALY’S GREATEST CITY, ROME, CENTER OF POWER, GREED AND CORRUPTION TO STRIKE AT THE HEART OF THE ENEMY. FOR THE FIRST TIME, TAKE PART IN AN INNOVATIVE MULTIPLAYER LAYER AND EMBODY AN ASSASSIN OF YOUR CHOOSING, DEFINE THEIR KILLING STYLE AND MATCH YOUR SKILLS AGAINST OTHER PLAYERS FROM AROUND THE WORLD. 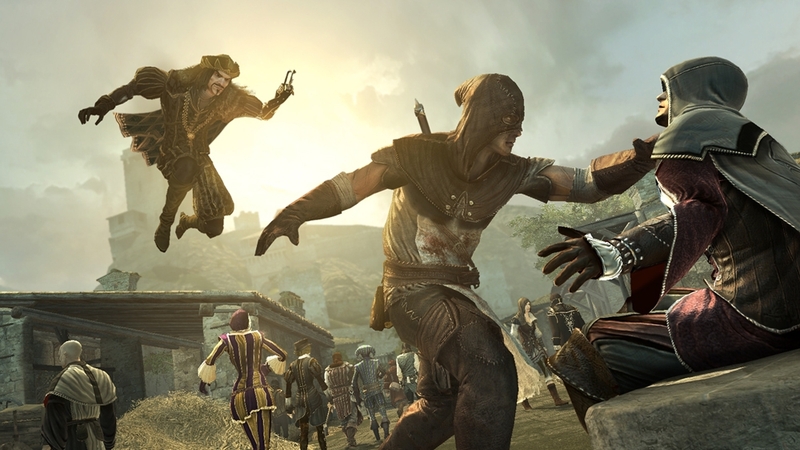 The multiplayer DLC addition is the biggest expansion to the award-winning Assassin’s Creed Brotherhood multiplayer, including one new map, four new characters and two new game modes. 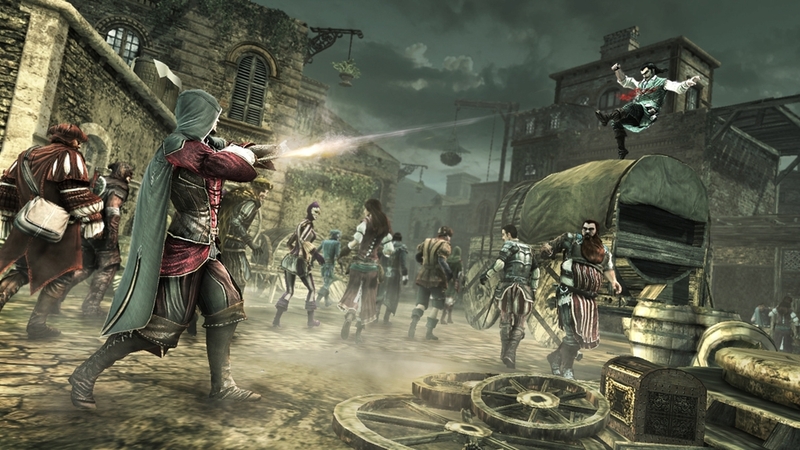 Before diving into this all new adventure, check out the action-packed trailer to learn about the multiplayer features of “The Da Vinci Disappearance” DLC out March 2011. After the fall of the Borgias in Rome, Leonardo Da Vinci is kidnapped by an underground cult dedicated to transforming mankind. 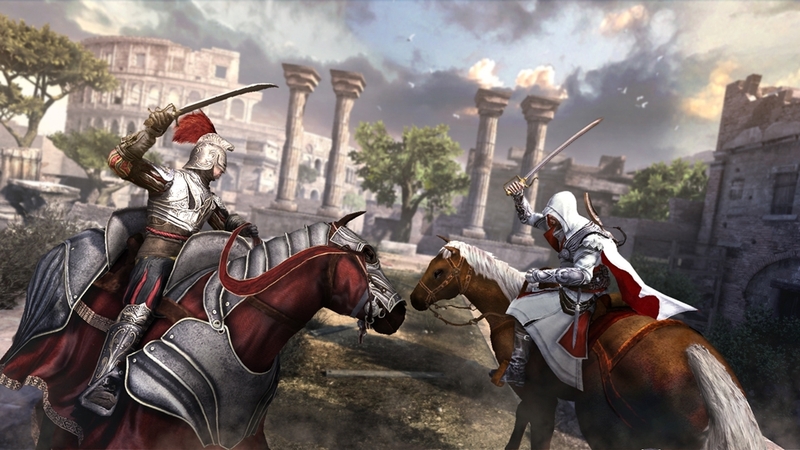 Ezio will embark on a relentless quest to recover stolen paintings in order to find Leo before it is too late, discovering two new locations and two new gameplay features along the way. 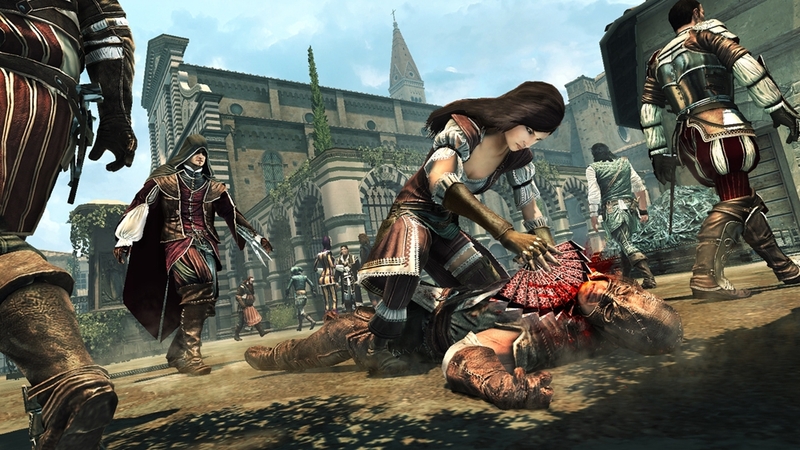 Before diving into this all new adventure, check out the action-packed trailer to learn about the single player features of “The Da Vinci Disappearance” DLC out March 2011. 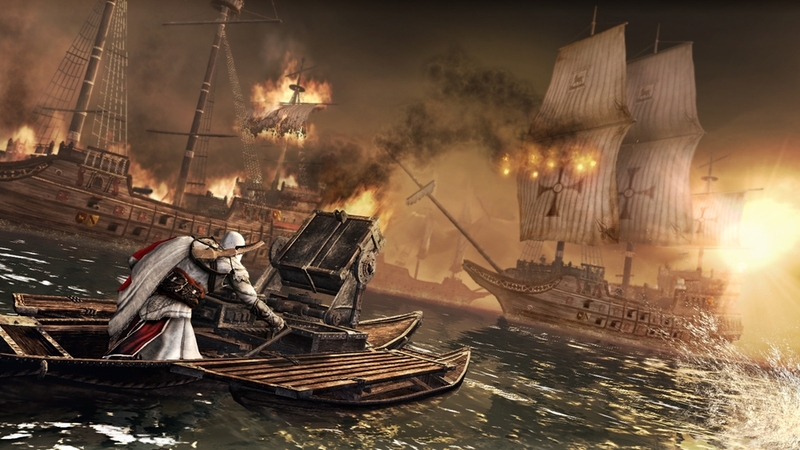 The Da Vinci Disappearance single-player and multiplayer DLC will be arriving March 2011. Before embarking on Ezio’s next adventure and experiencing all new multiplayer features, get a sneak peak with this teaser trailer. The new Pienza Map is set against central Tuscany’s background and landmarks such as the Palazzo Piccolimini and Palazzo Comunale provide the perfect free-running playground where predator and targets can blend and disappear. 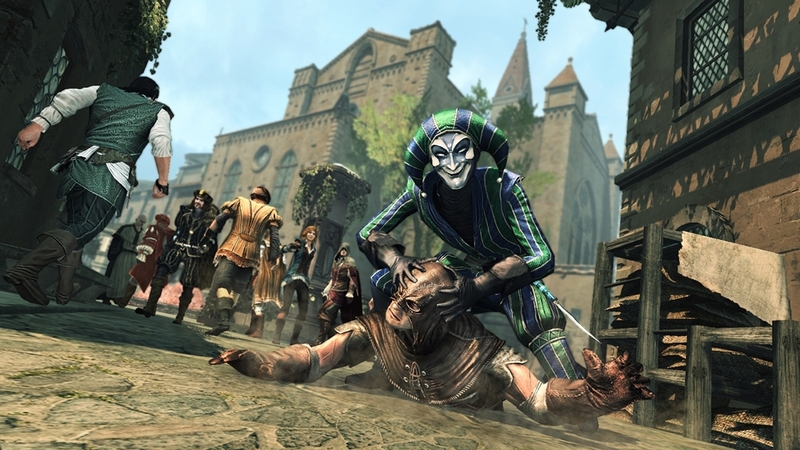 To dominate, employees must master the town’s layout as it’s free-running routes can become the recruit’s ally or doom. New Chest Capture Multiplayer Mode • Six Players with two teams comprised of three players each • Player’s objectives are to partner with fellow Templars to either defend or capture Chests. • Defenders will receive points for assassinating and defending the chests. Capturors will earn points by capturing the chests. New Templar Score Feature • Updated weekly and based on users scores of the previous four weeks, it splits recruits in 10 specific slices – each representing part of the hierarchy of the community. The goal is to reward diligent work by Abstergo recruits. Abstergo rewards its recruits and enhances its Training Program with the all new DLC featuring the new map ‘Mont Saint-Michel’ and one new mode ‘Advanced Alliance’. Located on the rocky tidal island of Normandy in France, Mont Saint-Michel offers a breathtaking scenery sure to enchant all. Its particular topography of narrow streets, high perched bell-tower and multi-leveled architecture is perfect for hunters and predators alike to surge from nowhere and execute their prey. To survive, recruits will need to use free-running and narrow roads to their advantage. 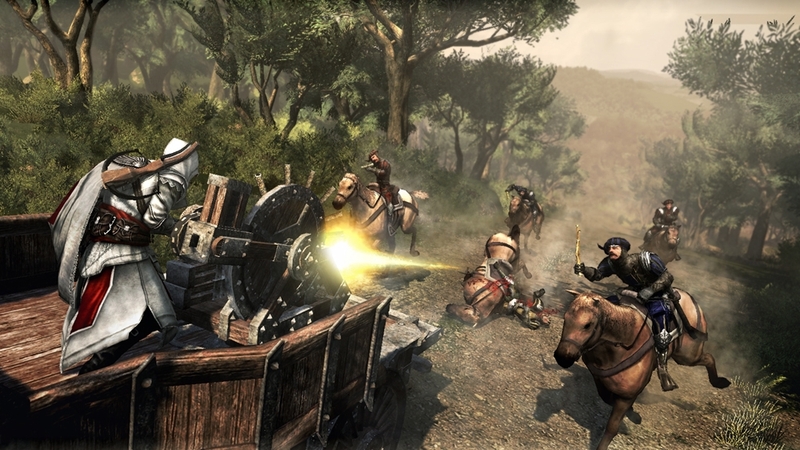 Description of “Advanced Alliance” Mode - Six Players with 3 teams comprised of 2 – Each match consists of 2 four minute rounds - Target identification and engagement are more difficult than in the basic Alliance Mode, players will need to maximize their skills and use caution to survive. There’s nothing like a nice day at work for the Barber: Whistle a catchy tune, place yourself behind your client, adjust his chair to the perfect height, gently pass your hand under his chin, pull back his head, and take care of business. Decadent to every extreme, the Noble has exploited life to its fullest. But after losing an arm to a courtesan held captive in a palazzo, precautionary measures had to be taken. The new claw ensures that no one, woman or man, will win again. Sailing from port to port, the Smuggler never sleeps. Although she makes her money by selling her victims to the highest bidder, some of her best prizes never make it to market. Introduced to her Hidden Blade, those strong fools who try to fight are left to float out to sea with the tide. Running in the streets, bumping into people, the target is out of breath. He knows his pursuer is here somewhere, watching him, ready to take away his life. Suddenly, he stops and looks up. There, on the rooftops, the Prowler gazes down, smiling at him. It's already too late. The Prowler activates a Hidden Blade and jumps on the target. Eliminating him in one fell swoop. Obsessed with numbers and calculations, only living by the rules discovered by great mathematicians, the Engineer never attacks targets without careful preparation. Accompanying plans for action, the Compass has pierced more flesh than paper. Don’t feel like dressing up in full costume today but still want to show your Assassin pride? Try on the Assassin’s Creed emblem hat for a more subtle yet intimidating look. THIS FILM IS NOT RATED BY THE ESRB Assassin’s Creed® Ascendance is an animated story produced and developed by Ubisoft Montreal. 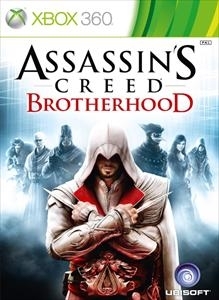 Bridging the narrative gap between Assassin’s Creed® 2 and Assassin’s Creed® brotherhood, Assassin’s Creed® Ascendance follows Assassin Ezio Auditore as he struggles to remove the treacherous Borgia family from their papal throne. 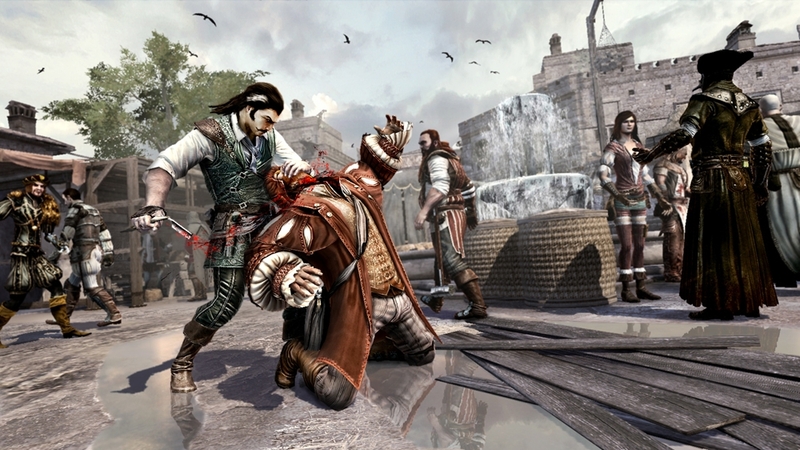 Ezio will learn the brutal truth behind Ceasare Borgia's rise to power. 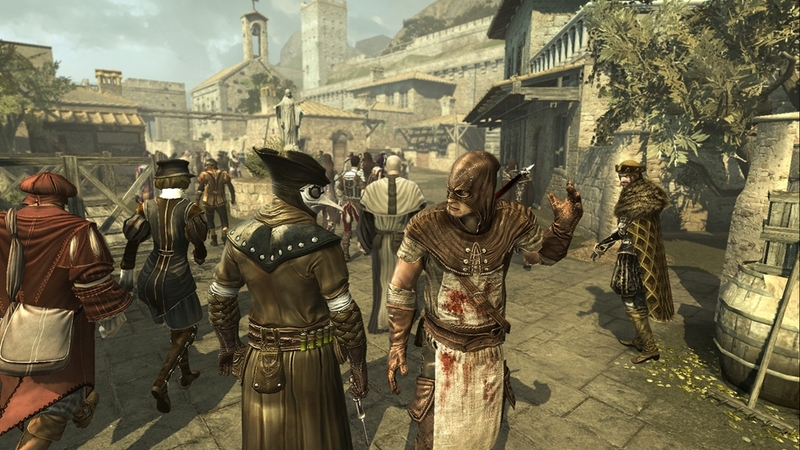 Fratricide, betrayal, torture... Cesare employs any tactic to achieve his ambition - ultimate control of Italy. Ezio has found his nemesis.